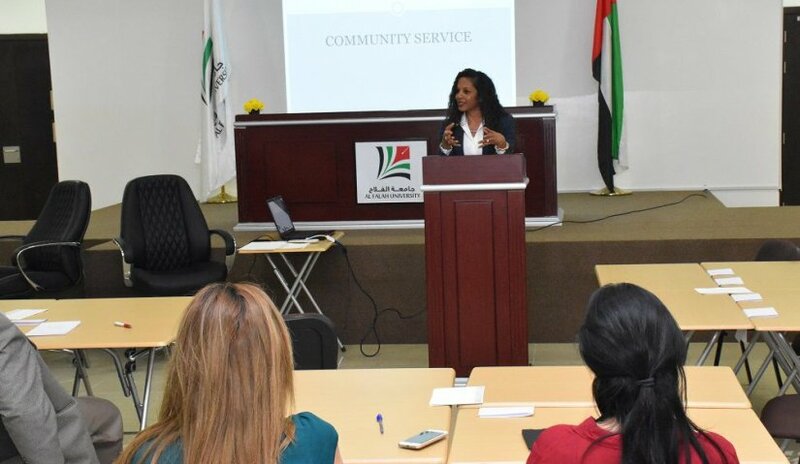 Al Falah University (AFU) hosted a presentation on Community Service on 27 September 2015. The presentation was made by Dr. Bernadette Warner, Dean of the College of Business Administration and included the Vice President for Academic Affairs, Dr. Sameer Al-Barghouthi, faculty and staff members. The intention is to organize faculty and staff expertise, as well as the University’s facilities, equipment and learning resources to provide recurrent benefits to the community beyond the classroom, while regarding the community as a prime stakeholder in the continuous development of the University’s programs and services. The goal of faculty and staff involvement in active community service is to generate support for the University from external stakeholders, by means of identifying specific needs that can be filled by faculty competences, whether these needs are articulated or not, and by encouraging faculty and staff members to meet these needs in ways that can generate recognition for the University. The intention is to create shared value in a strategic way that allows both the University and the community to benefit from this interaction. It is important to note that the Commission for Academic Accreditation (CAA) requires licensed UAE institutions of higher education to demonstrate their service to local community needs. Accordingly, faculty/staff community activities need to be included in annual evaluation criteria and professional development plans. The responsibilities of the Community Engagement Committee will include the elaboration and implementation of AFU’s community engagement plan, as well as its continuing evaluation for the purposes of quality enhancement. The Committee will work in collaboration with College Deans, and will lead in establishing the initial Community Engagement Plan. College Advisory Councils may provide feedback regarding the co-curriculum and community engagement plan evaluation. This Committee will also help to ensure that all community activities are consistent with the mission of the University. Committee Responsibilities · Encourage faculty research and conference, seminar and workshop presentations relating to community issues, given the available expertise in each College, whether from a local, regional or international perspective · The Committee Chair will explore additional opportunities for relevant faculty and staff to contribute their expertise to community partners in business, industry and the government. The community activity of program faculty will be included in their annual performance evaluations, as well as their professional development plans. · All of the University’s faculty and staff are kept informed of AFU’s community engagement agenda by emails, posters, text messages, and social media, and are provided with structured opportunities as desired to contribute to program initiatives, and to suggest new ideas. For Al Falah University, community engagement may be viewed as a win-win proposition, one that also enriches the experience of participating faculty and staff members, potentially also providing practical experience that can feed into research-led teaching.